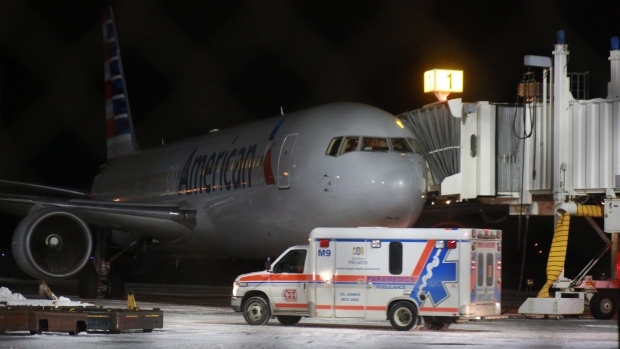 An American Airlines passenger jet was forced to make an emergency landing in St. John's, N.L Sunday night after hitting severe turbulence. After landing, three flight attendants and four passengers were transported to a St. John’s hospital “for further evaluation,” the airline said in a statement. A spokesperson with St. John's International Airport confirmed that "some" people onboard are injured, but the nature or seriousness of the injuries wasn't immediately clear. American Airlines said that they are "taking care of our passengers and crew, and we are working on next steps to get them safely to their destination." American Airlines Flight 206 took off from Miami at 3 p.m. local time and was en route to Milan when the jet hit “severe” turbulence. The seatbelt light was on at the time, the airline said. The plane was diverted, and made the emergency landing at 9:45 p.m. at St. John’s International Airport. Ambulances and paramedics were waiting on the tarmac with stretchers. The flight had 192 passengers and 11 crew members on board, American Airlines confirmed.